Reliance has already set the internet world on fire by launching the Free 4G Internet for six months. They are unstoppable yet and launching the best and cheapest Jio prime offer for their customers in INDIA. Jio Happy New Year offer is going to end on 31st March, So Reliance introduced Jio prime offer in which user can recharge by Rs. 99 to avail the service for one year. After that user can recharge for their Data Plans which are cheapest in the world. At the price of 300 users can get 1 GB per day along with unlimited Audio and Video calls for one month. Recently we have seen Jio introduced “Buy one get one” offer for their customers in which user can get extra data. 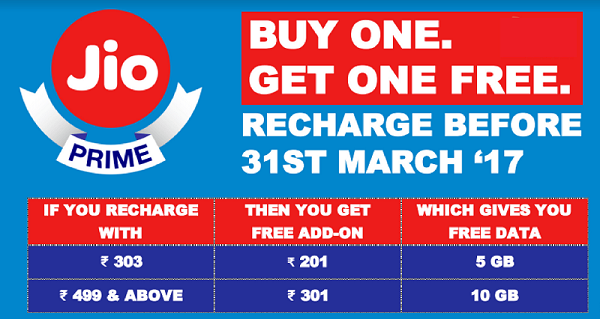 Users can avail these offers before 31st march. Under “Buy one get one” offer Jio is giving away 5 GB AND 10 GB of extra 4G Data at Rs. 303, rs. 499 respectively. If a user recharges their Jio number with any of these plans then they will get 5GB or 10 GB (Rs. 303, Rs. 499) extra for one month along with 1 GB data per day. Under 499 plan users will get 56 GB of 4G data per month with the limit of 2GB per Day. In 499 Plan Jio is giving 10 GB extra data per month so that user will get 120 GB of free data in the period of 12 months. The best part of Jio “Buy one get one offer” is users can also recharge their number with Rs. 2944 and get 10 GB extra data for six months of period. The additional data which you get in these plans comes into play when you exhaust the daily FUP limit. So what are you waiting for? Register yourself for Jio Prime offer membership in only Rs. 99 and recharge with any of these plans to get benefits.